Dr. Karie Stamer directs Northwestern's online RN-to-BSN program and serves as a professor in the college's on-campus undergraduate nursing program. 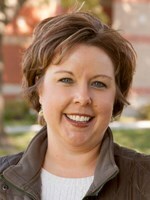 She has extensive teaching experience, including a strong background in the development and delivery of online courses. She previously taught at Northwest Iowa Community College for seven years. She also worked for the Orange City Area Health System for 11 years as a nurse manager and floor nurse. As such, she provided direct client care in medical/surgery, same-day surgery, the cardiac/coronary care unit, obstetrics and the emergency room. Other responsibilities included serving as a client advocate, interacting with physicians, educating clients regarding current health concerns, and mentoring new staff. Stamer earned her R.N. diploma from St. Luke's School of Nursing, a Bachelor of Science in Nursing degree from the University of Iowa, a Master of Science in Nursing, with an emphasis in nursing education, from Nebraska Methodist College, and a Doctor of Nursing Practice from American Sentinel University.